A bowl of soup’s favourite sidekick! 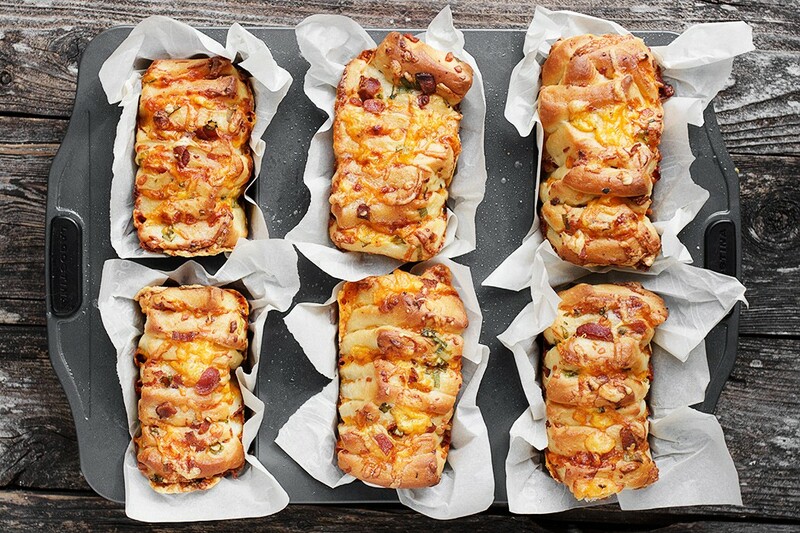 This Loaded Baked Potato Pull-Apart Bread has all the flavours of loaded baked potatoes in little pull-apart breads. Are you a soup dipper? Do you live for fresh bread to dip in to warm soup? Or is it just me :) Fall isn’t just the return of soup season for me, it’s the return of fresh bread to dip in my soup season. These Individual Loaded Baked Potato pull-apart breads have been an idea kicking around in my head for ages, that finally became reality this past week. The bread itself is flavoured with potato flour (or instant mashed potato flakes) and sour cream. 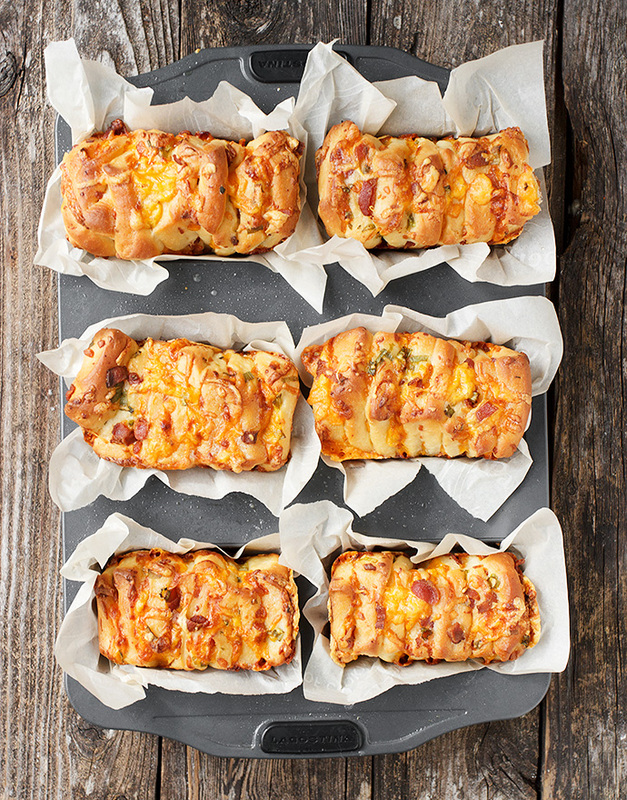 Inside the pull-apart layers is a mixture of cheddar cheese, green onions and bacon. I have to tell you, when I opened the oven door to check the bread when it was almost done, the smell that came out of the oven was definitely loaded baked potato! These little breads are perfect for pulling apart and dipping in to soup, especially soups like tomato or anything creamy. Canadians can easily find both potato flour and dry milk at any Bulk Barn, so I definitely recommend that route, so you don’t need to buy large quantities. The potato flour can be found in with the gluten free flours and for the dry milk, look for the non-instant whole milk powder. As noted in the recipe, you can easily replace the potato flour with instant mashed potato flakes. If you don’t want to use the dried milk, simply replace part of the water with milk. These are fun, delicious and the perfect sidekick for any bowl of soup. Especially nice with tomato or any creamy soup. You can make these as 6 individual pull-apart loaves or as one 9x5-inch pull-apart loaf. In a large bowl or the bowl of a stand mixer fitted with a kneading hook, combine the yeast with 1/3 cup warm water and let stand 5 minutes. Add remaining 1/3 cup water (or milk, if you aren't using dried milk powder). Add the potato flour, milk powder (if using), sugar, salt, soft butter and sour cream. Stir to combine well. Add 2 cups of the flour and mix until combined. Begin adding more flour 1/4 cup at a time, kneading, until dough comes together and is elastic and moist, but not sticky. Grease a large bowl and add dough to bowl. Cover with plastic wrap and set aside to rise until doubled, 60-90 minutes. While dough is rising, prepare the filling ingredients. Grease a 6-loaf mini loaf pan or a 9x5-inch loaf pan. Remove dough to a well-floured surface that you can cut on. Roll in to a 12-inch by 18-inch rectangle. Sprinkle dough with shredded cheddar cheese and press lightly in to dough. Sprinkle with crumbled bacon and chopped green onion. To make individual mini-breads: Using a sharp knife or a pizza cutter, with the shorter 12-inch side closest to you, cut dough into six 2-inch strips, cutting from top to bottom. Make one cut across the middle from right to left to make 12 strips total. Starting with the top 6 strips, carefully stack the strips one on top of the other. If some of the filling falls off, just pick it up and place back on top before adding the next piece. Repeat with the bottom 6 strips. You will now have two stacks, roughly 2-inches wide by 9-inches long. Using a sharp knife, cut each stack in to 3 even pieces, to make a total of 6 pieces of about 3-inches by 3-inches. Cut eat of these pieces in half, to make a total of 12 pieces. Place two pieces in to each mini loaf cup. Spray a piece of plastic wrap and place it sprayed side down over the mini loaf pan. Allow to rise until puffy, about 45-60 minutes. For one 9x5-inch loaf: Using a sharp knife or a pizza cutter, with the shorter 12-inch side closest to you, cut dough in to four 3-inch strips, cutting from top to bottom. Make one cut across the middle from right to left, to make 8 strips total. Starting with the top 4 strips, carefully stack the strips on on top of the other. If some of the filling falls off, just pick it up and place back on top before adding the next piece. Repeat with the bottom 4 strips. You will now have two stacks, roughly 3-inches wide by 9-inches long. Cut each stack in half, to make a total of 4 pieces that are 3-inches by 4 1/2-inches. 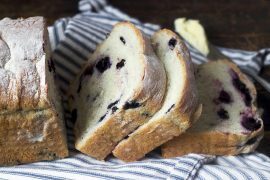 Place stack pieces side by side in to prepared 9x5-inch loaf, with the wider side down. Spray a piece of plastic wrap and place it sprayed side down over the mini loaf pan. Allow to rise until puffy, about 45-60 minutes. When dough is about ready, preheat oven to 350° F. Bake in preheated oven until golden brown and they sound hollow when tapped on top, 25-30 minutes. I am stumped on the last step. I am making the the one large loaf pan. I have the 4 stacks of 4, but when I put them in the loaf pan do I turn them on their side? what stops all the toppings from falling to the bottom of the pan? Help? Hi Kris, Yes, just place them on their side – side by side. They still have to do another rise and once they do, all the good stuff will be safe inside once that happens. This recipe is a stroke of a genius, Jennifer! Everything I love in one little bite. I can skip soup altogether just to have these! These look fantastic! 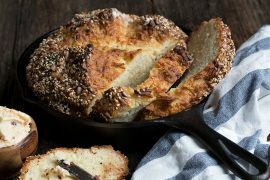 I have been contemplating a bazillion different pull apart bread recipes and this one just moved to the top of the list! Hope you enjoy them, Janet! Please excuse me while I go wipe the drool off of my keyboard – this looks amazing! With a bowl of soup or just on its own -showstopping!!! Wow. Just wow! I like the flavor and fluffiness of potato bread. This recipe just brought that to a whole new level. My jaw dropped when I saw that first beautiful photograph by the way. WOW! This looks FANTASTIC! I’m totally drooling at the photo of the bread pulled apart. Also, what the heck? 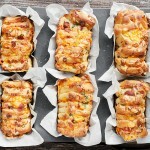 How did I never think of savory pull-apart bread?! 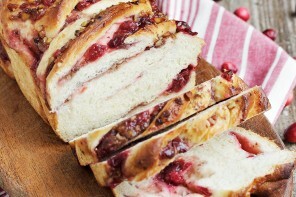 Well if you weren’t already the Pinterest Queen, I imagine this will skyrocket you there :) Gorgeous loaves! This sounds really delicious! Ooooh, that looks so good! I want pull apart baked potato bread right now! Soup be damned, I just want that bread! In case you missed all those exclamation marks, I think this recipe is fantastic. I’ve pinned and will definitely be making this sometime very soon. Perfect comfort food for the cooler weather we’re having now. Thanks for the recipe! Pull apart bread is my favorite! I’ve only done sweet versions, but this savory version is calling my name!! This bread sure caught my eye right away! 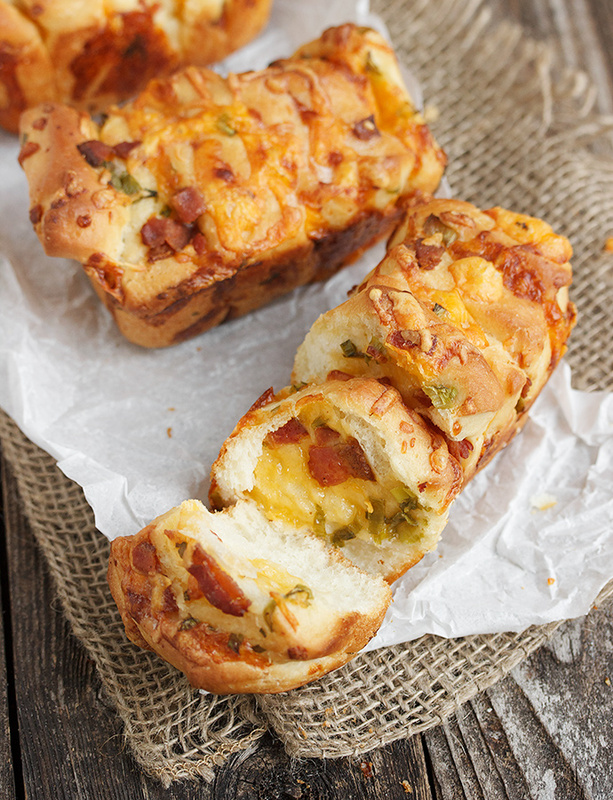 Two of my favorite things, loaded baked potatoes and bread, all wrapped up into one! Pinned! Gosh, just love pull-apart bread!! :-) looks awesome! You’re Insane! Insanely Great, That Is! Absolutely love these breads, the individual portions are just perfect! This sounds ridiculously good jennifer – freezing them is a great idea for those cozy nights in! Thanks Millie. I freeze a lot of stuff (we just can’t eat it all :), so always have something delicious in there when we feel the need! I would be so tempted to eat the whole pan. These look delicious! No soup needed! Thanks Emily and yes, they are of course delicious all on their own, too :) I froze the extras to keep them a little further out of reach! These look incredible Jennifer – I am a totally soup dipper and I love the idea of using potato flakes too! Thanks Jessica. The potato flakes are a good alternative for anyone who can’t find potato flour. This is such a great idea! They look absolutely delicious! My partner is definitely nudging you out of that ‘soup as an excuse for dipping bread’ category. He can’t get enough of it! Though I would omit the bacon, I think these would make a lovely treat for him. Thanks for the recipe! Lol Ksenia. I might just fall in to the ‘soup as an excuse’ category, too ;) These would still be great without the bacon. Still lots of flavours going on. Dying over these!! I am definitely a soup dipper – though when I have soup with bread it’s more like bread with a side of soup… ;) These look like my next dinner!! This bread looks straight up dangerous! So much goodness in here! Those. Layers. GAH!